Home / More / Library / List of Medicinal Plants / Commelina spp. PLANT NAME: Commelina diffusa N. L. Burm. COMMON NAMES: Honohono, mäkolokolo [Hawai’i]; wandering jew, day flower [USA]; ya zhi cao [China]; ban kane [Nepal] mau’utoga [Samoa]; french weed [West Indies]; watergrass [Trinidad]; zeb gwa [Dominica]; curage [Guadaloupe]; codillo (Spanish); tsuyu kusa (dewy herb) [Japan]; kabocola [Fiji]. NOMENCLATURE: The plant is named after three Dutch botanists named Commelijn. One petal of the flower was said to be for Jan Commelijn (1629-1692), another for his nephew Caspar Commelijn (1667-1731), and the third petal was for one of their relatives who died before achieving fame. That’s why we don’t know his name. CATEGORY: Herbs that clear heat and fire. PLANT PART USED: All of it. TOXICITY: There is one reference to Commelina forsskalei as being toxic, [http: / / www.ars-grin.gov / cgi-bin / duke / ethnobot.pl] but other than that I could no other evidence for any toxicity within this genus. As far as I know C. forsskalei does not grow in Hawai’i. CAUTIONS AND CONTRAINDICATIONS: Not in pregnancy. PREPARATION OF MEDICINE: Infused, decocted, juiced, steamed. DOSAGE: 1-2 oz. of fresh herb in decoction; or crushed for topical use. MERIDIAN AFFINITIES: Bladder, liver, lung, and stomach. WESTERN FUNCTIONS REPORTED: Abortifacient (C. diffusa; C. coelestis); anti-inflammatory; anti-swelling; antibacterial; antibiotic; antipyretic; antitussive; astringent; bactericidal; demulcent [China]; depurative [Hawaii, Japan, Trinidad]; detoxifying; diuretic [China, Fiji, Haiti]; emennagogue [India]; emetic (C. nudiflora) [Samoa]; emmoliant; expectorant; febrifuge; hemostat; laxative [Samoa]; lenitive [China]; refrigerant; styptic [Hawaiʻi]; tonic [Egypt]. 1) Cools the blood and stops bleeding. 2) Clears heat, quells fire. 3) Expels wind dampness, reduces swelling and inflammation. 4) Clears the lungs and opens the chest. 5) Clears lower burner damp heat. Red inflamed eyes [Hawai’i (sap topical)]. Bleeding [China, Mexico]; heart problems [Japan, South Africa]; hypertension [China]. Abdominal obstructions [China]; diarrhea (decocted) [China, Japan]; diarrhea [China]; enteritis [China (acute), Latin America]; hemorrhoids (topical and internal) [China, Mexico]; stomach problems [Egypt]; aid to digestion [Fiji]. Conjunctivitis; eye problems (juice topical) [China, Egypt, Fiji, Hawai’i, Latin America, Zanzibar]; ophthalmia [Africa, China]; juice of stem used to remove dirt and grit from the eyes [Hawai’i]. Laryngitis [China]; sore throats, acute tonsillitis, pharyngitis (gargled juice or decoction) [China]. In Hawai’i the stem sap is used to remove dirt from the eye, and to soothe inflamed eyes. I have used it numerous times for my own eye problems includinga turpentine splash in the eye. Abscess, boils (topical & internal) [China, India, Malaya, Trinidad]; fever (decocted) [China, Haiti, Trinidad]; leprosy [Nepal]; malaria [China, South America]; to prevent infection [China]. Insect and snake bites (topical) [China, India]. Juice dripped into cuts to stop bleeding [Fiji, Hawai’i, Samoa]. Swelling [Ghana, Japan]; spasms [Haiti]. Nervous conditions [Dominican Republic, Haiti, South Africa]. Inflammed uterus; painful menses [India. Latin America]; abnormal uterine bleeding [Mexico]. Infertility [Paraguay, South Africa (C. benghalensis)]. Gonorrhea [China, Latin America]; groin “problems” [Egypt, Ghana]. Common cold, cough, influenza [Carribean, China, Trinidad]. Coughing up blood [Carribean, China, mexico]; tuberculosis (infused) [Acoma, Laguna, Mexico]. Specific for cough with sticky phlegm. Bladder infection [China, Trinidad], painful or difficult urination [China]. Edema [China]; kidney ailments [Latin America]. A punahele (favorite) for cystitis with painful urination. Food for livestock [Carribean, Hawai’i, India]; infusion used as aphrodesiac for livestock (C. dianthifolia) [Navaho]. Weight loss from chronic disease. USE AS FOOD: Use the tips fresh in salads or as a vegetable (cooked 10 minutes) [Universal]; famine food; pot herb eaten in spring [China]. OTHER USES: Blue flower as a dye. Painful urination or dry cough: With Hibiscus tiliaceus (hau) inner bark or flowers. For respiratory infection decocted with Taraxacum spp. (dandelion) and Morus alba (mulberry) [China]. There are 170 species of Commelina. The Japanese reportedly use Commelina flowers for making a kind of paper called Awobana. 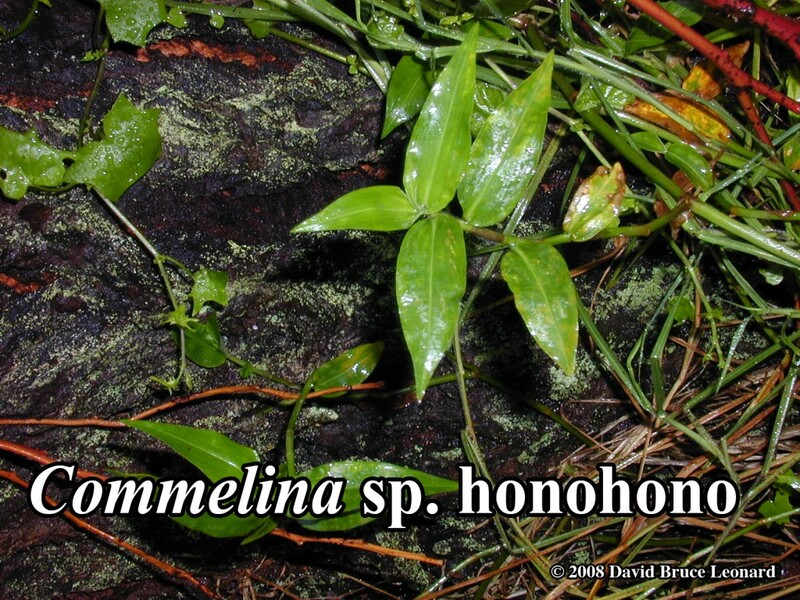 Honohono (Commelina spp.) is a good example of the Hawaiian herbal description of “puhi” (literally “eel”), which means “slippery.” A great remedy where mucous membranes are inflamed or there is eye irritation. Works on that dry hacking cough. Bista, M. S., director. 1997. Medicinal Plants of Nepal. 5th ed. Kathmandu: His Majesty’s Government, Ministry of Forests and Soil Conservation, Department of Natural Resources. Bista, M. S., director. 1997. Medicinal Plants of Nepal. (Supplement Volume). 2nd ed. Kathmandu: His Majesty’s Government, Ministry of Forests and Soil Conservation, Department of Natural Resources. Bliss, Beatrice. 1973. Chinese Medicinal Herbs (Li Zi-Shen’s Ben Cao). San Francisco: Georgetown Press. Duke, James. The author’s correspondence with James Duke. Haselwood, E.L. and G. G. Motter, eds. 1983. Handbook of Hawaiian Weeds. 2nd ed. Honolulu: University of Hawai’i Press. Honychurch, Penelope N. 1986. Caribbean Wild Plants & their Uses. London: Macmillan Education Limited. Huang, Bing Shan. 1993. Thousand Formulas and Thousand Herbs of Traditional Chinese Medicine. Volume One: Materia Medica. Harbin, People’s Republic of China: Heilongjiang Education Press. Moerman, Daniel E. 1986. Medicinal Plants of Native America. Volumes 1 & 2. Ann Arbor, MI. : University of Michigan Museum of Anthropology. Montagna, F. Joseph. P. D. R. People’s Desk Reference. Volumes 1 & 2. Library of Congress #80-52954. Naone, Lyons Kapi’ioho. Conversations with Lyons Kapi’ioho Naone. Neal, Marie C. 1965. In Gardens of Hawai’i. Honolulu: Bishop Museum Press. Peterson, Lee Allen with Roger Tory Peterson. 1999. A Field Guide to Edible Wild Plants: Eastern and central North America. Houghton Mifflin Co.
Tang X.Y., et al. 1994. Active constituents of Commelina communis L (Article in Chinese) Zhongguo Zhong Yao Za Zhi May; 19(5): 297-8. Wagner, Warren L., et el. 1999. Manual of the Flowering Plants of Hawai’i. Volumes 1 & 2. Revised ed. Honolulu: University of Hawai’i Press. Whistler, W. Arthur. 1996. Samoan Herbal Medicine. Honolulu: Isle Botanica.